OpenSimulator is a large and organically grown project, so its architecture is still subject to change. As such, there are very few formal internal interfaces - region modules operating by plugging in directly to the core internals. An diagram of the core parts of the simulator code organization. This is a very high level diagram of the main chunks of the simulator code organization. Arrows indicate direction of request initiation. A viewer (at the bottom) interacts with the simulator by sending messages through both UDP and HTTP. Regions and region modules register for UDP message events (e.g. user command inputs such as move forward, inventory manipulation requests, etc). These events are invoked when the LLUDP client stack receives the relevant requests from the viewer. 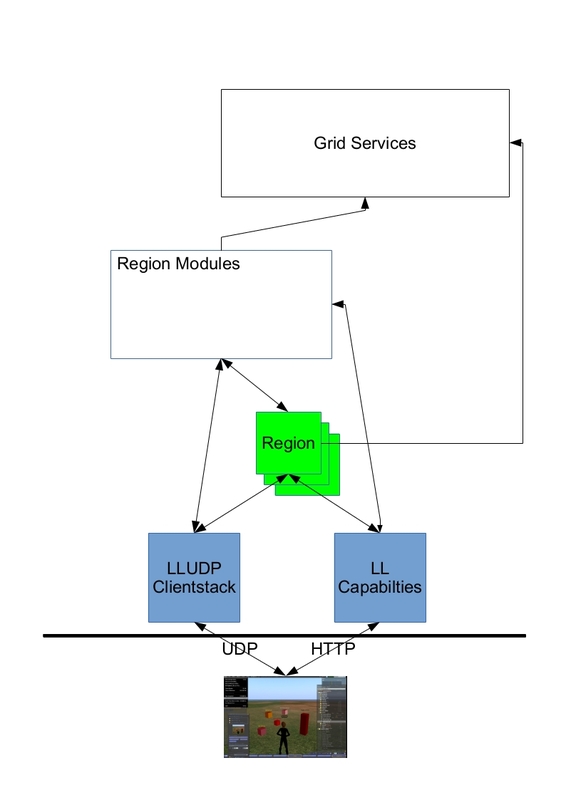 In turn, the regions and region modules will pass messages back to the LLUDP clientstack (e.g. movements of avatars and objects) for delivery back to the client. LL capabilities are a similar message passing mechanism but with HTTP as the carrier rather than UDP. These tend to be used for messages which are not time critical and are often used for moving large amounts of data in newer viewers (e.g. texture and inventory request and delivery, though not other inventory commands such as item move). Again, these are handled by regions and region modules. A simulator can pass messages back to the region via the event queue capability, which is essentially a poll by the viewer to the simulator to fetch messages. Regions and region modules will in turn communicate with backend grid services to fetch required data (e.g. assets), manipulate inventory, etc. In OpenSimulator standalone mode, services will be in the same process as OpenSim.exe. In grid mode, they will be hosted in a separate Robust.exe process. More exotic configurations of OpenSimulator would complicate this diagram. For instance, it's possible to configure OpenSimulator to fetch assets directly from capabilities implemented in the same process as the grid service rather than go through the simulator. OpenSim.Addons. OpenSimulator components which came originally from the Diva distribution. Hence their different organization compared to other features. OpenSim.Addons.Groups. Core support for user groups. OpenSim.Addons.OfflineIM. Core support for offline IM. OpenSim.ApplicationPlugins. Each package is an individual application plugin - an application plugin is a modular piece of code that has an effect on the entire region server. See RegionModules for more details or one of justincc's blogposts for a higher level overview (which should really be in this wiki). OpenSim.Capabilities. Basic structures for capabilities support. OpenSim.ConsoleClient. RestConsole for connecting remotely to the OpenSimulator console. Not widely used as of yet - more commonly OpenSimulator is started in a screen instance in Linux and in separate terminals in Windows. OpenSim.Data. This is all the low level database manipulation stuff. In here, you'll see packages for SQLite, MySQL and MSSQL (which tends to lag). OpenSim.Framework. General framework code used by the rest of OpenSimulator which is either not specific to regions or used in common with regions and other classes. OpenSim.Framework.AssetLoader.Filesystem. Small DLL used to load library assets from the filesystem. OpenSim.Framework.Communications. Some comms related odds and ends. Notably request limiting code in OpenSimulator master git branch post 0.7.6. OpenSim.Framework.Configuration.HTTP. Old code for loading configuration via HTTP. May have decayed beyond usefulness. OpenSim.Framework.Configuration.XML. Code for loading XML config files (as opposed to INI). May have decayed beyond usefulness. OpenSim.Framework.Console. Framework classes for the OpenSimulator console. OpenSim.Framework.Monitoring. Statistics gathering and monitoring infrastructure. OpenSim.Framework.RegionLoader.FileSystem. Code for loading region configuration from the filesystem (e.g. bin/Regions/Regions.ini). OpenSim.Framework.RegionLoader.Web. Code for loading region configuration remotely. OpenSim.Framework.Serialization. Infrastructure for OAR and IAR read and write. OpenSim.Framework.Servers. Contains generic server code, such as the base OpenSimulator server and http servers. OpenSim.Region. Contains most of the meaty code that it specifically concerned with regions/scenes. OpenSim.Region.ClientStack. Small amount of infrastructure for making different UDP client stacks available (though currently only LLUDP exists). OpenSim.Region.ClientStack.LindenCaps. The code necessary for communicating with clients using the HTTP (capability) part of the Second Life protocol. Glues data going to/from the client to region modules that handle specific aspects. OpenSim.Region.ClientStack.LindenUDP. The code necessary for communicating with clients using the UDP part of the Second Life protocol. Glues data going to/from the client to scene and region module code. OpenSim.Region.CoreModules. The region modules considered core to OpenSimulator (and thus come bundled with it). This covers a vast range. For example, the Avatar/Attachments/AttachmentsModule handles avatar attachments (though with many structures still in core region code). The Framework/EntityTransfer/EntityTransferModule handles region crossings and teleports (though again in co-operation with large chunks of core region code). OpenSim.Region.DataSnapshot. Code for creating an XML file that summarises the contents of the region. Could be exposed to an external search engine. OpenSim.Region.Framework. The framework for the region itself, including scene graph, scene presence (agent) classes, scene object classes, inventory, etc. Could be considered the core of the simulator. OpenSim.Region.OptionalModules. Optional region modules that aren't considered core to the simulator. In principle, could be removed yet have a working Second Life compatible simulator, though this has not been well tested. OpenSim.Region.Physics. General physics framework code and plugins for specific engines (BulletSim, ODE, etc). Only the ODE and BulletSim modules are mature or complete enough for use. OpenSim.Region.ScriptEngine. Script engine code that powers the scripts run within OpenSimulator. Currently there is only one engine bundled with OpenSimulator, XEngine. OpenSim.Region.UserStatistics. Web Statistics Module for exposing some simulator information via a webpage. OpenSim.Server.Base. Common server infrastructure for the simulator and Robust grid servers. OpenSim.Server.Handlers. Classes for handling raw incoming data and translating these to service requests. Used mainly in grid mode for ROBUST server instances. For instance, Asset/AssetServerGetHandler translates internal asset fetch requests to the asset service and replies with the results. OpenSim.Services. Code which provides both service implementations (e.g. AssetService to read and write assets to persistent storage) interfaces and infrastructure (chiefly OpenSim.Services.Connectors which creates the actually HTTP requests to invoke services remotely). In grid mode, these are instantiated within Robust.exe instances. In standalone mode, these are instantiated directly in OpenSim.exe. OpenSim.Tests.*. Test code, both common infrastructure used in regression tests and some standalone client test code. Actual regression tests are spread throughout the code base in separate *.Test packages (e.g. OpenSim.Region.Framework.Tests project). OpenSim.Tools. Some OpenSimulator associated tools. Not used in actual OpenSimulator operation. pCampbot. A test tool which uses bots to simulate activity load on a simulator. See pCampbot for more details. Not used in actual OpenSimulator operation. Because OpenSimulator has to run on both Windows and Mono (usually on Linux or Mac), we are limited to the parts of .net that the minimum version of Mono we require supports. This page was last modified on 6 April 2019, at 02:07. This page has been accessed 41,318 times.